Bruce Nauman’s ‘Days’ invites you to walk down a gauntlet of amplified sounds that surprise with their insistent intangibility in the long, narrow space illuminated with daylight. Words spill across the room and jostle for audibility. If you stand close to one of the 14 flat panelled speakers strung out in opposing pairs, the clarity of the words is discernible, but strolling down the centre of room in a straight line immerses the visitor in fluid sounds that occasionally cohere into words. Seven unseen people ranging in age from childhood to old age say the days of the week, as if they are chanting. These voices are clearer or weaker depending on your position in the room but they also suggest the essential, albeit, unseen individuality of each speaker. However, these seven named days of which our routines are made of are not ordered correctly in logical sequence. They are irrationally jumbled and articulated on inclination, thereby disrupting the reassuring structure of sequential time. Each unseen, anonymous speaker subjectively assaults the notion of this universal register that governs us all. Instead of reinforcing a unified cycle of time, these voices compete for attention in that confined room. 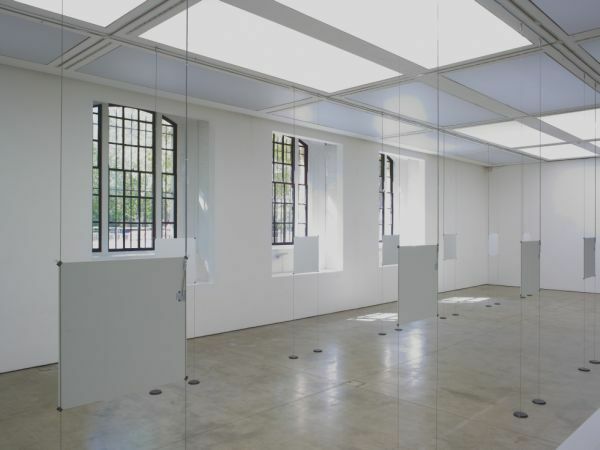 ‘Days’ takes the sound of the human voice as the subject and material of an installation comprising simple, flat, white speakers suspended at ear height on wire set approximately two metres apart across the floor. Here at the ICA, the piece is delineated by the floor plan of the modestly sized gallery which is entered by descending several steps down into an area unbounded by interior walls. Starting with the factual presence of speakers, Nauman moves his audience from the visible into the less certain realm of auditory perception. The artist and his protagonists’ gestural and physical presence is absent leaving only a proxy, the process of sounds emitted from the body which are then recorded, edited and finally amplified. What we experience is an ambient dissonance of sounds and meaning. We slip in and out of familiarity and structure. This is an arena of collapsing communication. Such spoken repetition of words progressively leads them from tools of common comprehension towards gibberish. Meaning slips away. And this profusion of noise within an urban setting might be expected, but Nauman’s willful manipulation of spoken language teases us and provokes confusion. This is not necessarily unpleasant but rather disorientating like one of those fair ground rides that toys with our internal spirit -level. Similarly, ‘Days’ interrupts artificial time, demonstrating the ease with which an artist can alter the parameters of common experience. Days of the week are some of our earliest instructions. We encounter them as the building blocks of comprehension alongside letters of the alphabet, colours and numbers. From infancy, our parents and teachers try to convey structure and logic through language, the skeleton of human relations. Naumann takes this certainty, embedded like a seed within us and instills doubt. From order we are gently led towards an exaggerated subjective experience that borders on psychic dissolution. These clashing sounds in the gallery suggest the hope that repetitious intonation can thwart impending chaos by reasserting an assumption of concrete fact. I first saw (or heard) this work in New York’s MOMA where it was exhibited within a pristine, sealed room. There Nauman’s work acquired an assertive, confident quality. It was less disconcerting and felt like an appropriate amplification of Manhattan’s competing energies and agendas encountered on the street below. At London’s ICA, ‘Days’ seems a more unnerving, inconclusive project. Inevitably, a sound installation such as this will adapt to its site, but in the incongruous setting of the Mall as the Olympic volleyball arena is being assembled nearby with all of the accompanying technology, time keeping andinvestment in accuracy, Nauman’s ‘Days‘ becomes a hesitant, wistful quest that exposes both our dependence on the calendar and it’s intrinsic artifice. Perhaps the days of the week inevitably slip out of alignment, as each of us take our own course through life, defying our best intentions to describe and share the irrefutable passage of the sun.